A few weeks back I woke up at 10am to start my Saturday. But unlike a usual Saturday outfit, my clothes had to be protective, old and ready to be trashed, literally. Dressed in my oldest, ugliest long sleeve shirt and stained black jeans, I headed to Action Environmental’s recycling facility in the Bronx where myself and a dozen other volunteers would be sorting restaurant garbage as part of the NYC Food Waste Challenge, organized by the NYC Mayor’s Office of Long Term Planning and Sustainability (OLTPS) and Global Green. My familiarity with food waste and the enormous role that restaurants play in creating food waste has grown significantly since volunteering with The Sustainable Restaurant Corps (SRC), a NYC based non-profit . SRC’s mission is to help make it easier for New York City restaurants to operate as more sustainable businesses. I also have seven years experience working in restaurants so I thought I had a solid understanding of restaurant garbage. I was wrong. The day began with lunch and an overview of what we would be doing that day. The joke was that we should eat while food still seemed appetizing. 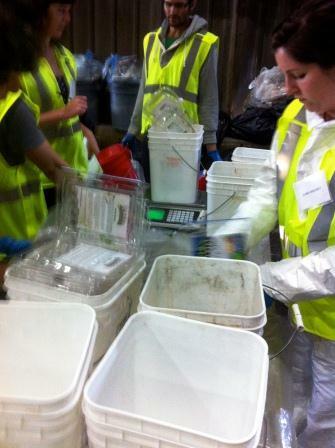 We each received neon vests, eye wear, gloves and optional full bodysuits before going to a huge indoor dumping section. To the right was a loud bulldozer pushing tons of paper and cardboard products toward a wide conveyer belt. To the left was a wall of trash bags, our smelly bounty. They were collected from a cross-section of restaurants across Manhattan. We split up into teams and got to work. The job was to open the bags, separate each item into a category bin, weigh each category then record the amounts. The data collected will help the city quantify the diversion potential. While sorting we were reminded to always separate each item as its diversion potential rather than as it looks. For example, a take-out container made out of cardboard, tattered, with rotting food stuck to it and stained with oil, looked like trash but had to be counted as recyclable cardboard. The initial improper sorting of the cardboard container at the restaurant as trash caused it to be contaminated and not recyclable. Had that cardboard been sorted correctly it would have been sent to a recycling facility like Action Environmental, diverting it away from the landfill. The first few bags, filled with mixtures of food (cooked and expiring) and recyclables and trash, were an assault on our senses. But we quickly adjusted to the smells, the sights and the sorting. After 4 grueling hours, over 50 bags of restaurant garbage were separated into diversion potential categories: Cardboard, paper, PET (plastic bottles), rigid plastics, metals, plastic bags, food & compostables (napkins), other plastics, glass, trash, etc. The Mayor’s Office is still crunching the numbers, but the mini mountains of non-landfill categories before us made NYC’s diversion potential evident to the naked eye. We all agreed that with some organization and education, NYC could achieve the City’s Landfill Waste Diversion goal of 75%. That means out of everything that could potentially go to the landfill, 75% of it is re-used, recycled, or composted. A 75% diversion goal may seem high, especially since NYC’s diversion levels have actually fallen over the last decade. According to the Mayor’s Management Reports, NYC’s curb-side recycling has dropped 50%, from 35.1% in 2002 to 16.6% at the end of 2012. But compared to other major cities NYC needs to play catch-up. Cities like Chicago, Cleveland, and Portland boast aggressive recycling and landfill reduction programs with diversion rates double, even triple, that of NYC. 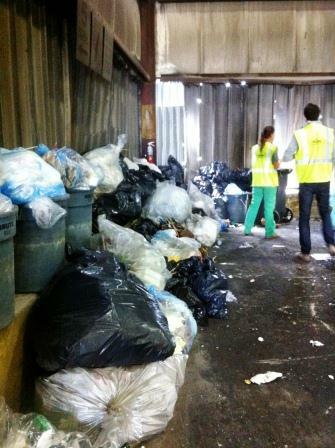 San Francisco has almost reached 80% annual landfill diversion rates, with “Zero Waste” as their new target. New York City has some unique challenges that other cities don’t face but the possibility for improvement is there. Recently the Department of Sanitation piloted a compost collection program in public schools and several residential neighborhoods throughout the city. The results are promising. However, without getting restaurants on board the city won’t reach it’s goal. According to the Mayor’s Office, restaurants are the largest contributors of food waste in landfills. They generate roughly a half million tons of food waste per year, which leads to increasing levels of methane gas in our atmosphere. The majority of restaurants do not compost because the services and infrastructure aren’t in place. Restaurant garbage is hauled by private contractors, not the city. If a restaurant wanted to compost it would have to pay additional hauler costs, further cutting into their small margins. The Sustainable Restaurant Corps is working with restaurants to find viable solution to this problem. They will be helping restaurants develop a food waste program that makes economic sense, meets health department requirements and is better for the environment. Stay tuned for our NYC Restaurant Sustainability Report, slated for early next year, that examines food waste and many other sustainability problems and solutions. Another big reason New York City needs to improve its waste management is China’s Green Fence Policy. Enacted earlier this year, Operation Green Fence significantly lowers the allowable level of “other” in its recyclable imports, from 10% to less than 1%. “Other” is defined as trash found among or stuck to recyclables as well as toxic materials. In the past, China had to further sort the recyclables and discard the trash and toxic materials in their own landfills. Fed-up with spending its own resources to purify imports, China now rejects millions of dollars worth of shipping containers at its ports. This drastic change has caused exporting countries to scramble, especially its largest importer of recyclables, the US. US Recycling companies have reported that millions of dollars worth of shipping containers have been rejected at Chinese ports due to improper “purity levels”. As a result, US recycling companies have lost revenue while cutting into their margins to reform their facilities, technology and processes. Now they are more discerning about the recyclables they receive and pick-up, which includes thousands of bags a day from their customers in the restaurant industry. Anything deemed contaminated is sent to landfills.